The holidays are here and I am wishing you all the best this season. I hope you’ll enjoy restful days and happy days. I am taking a bit of a break from the blog to just enjoy some downtime and hopefully catch up on some blog reading too! I’ve also started to look through my list of reads throughout the year so I promise to come back before the year is out to post my favorites of the year list. I’m looking forward to reading yours too. In the meantime, I hope you get lots of bookish gifts and Happy Holidays! Merry Christmas to you and your family Iliana! 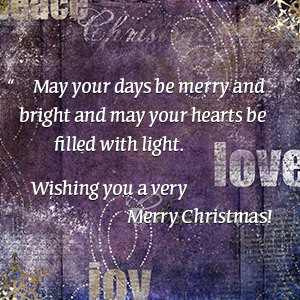 Wishing you special times today and always with your family and friends Iliana. Wishing you a very Merry Christmas. I hope today is filled with fun, special moments with those you love. And may this final week in 2016 be a good run up to an even better 2017. Merry Christmas! I just stumbled on your blog, and it’s very precious! You read so many authors from different countries. And poetry!!! Cheers. I hope you are enjoying your break, Iliana. Merry Christmas! Merry Christmas and Happy New Year, Iliana!